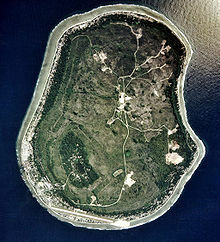 Nauru is a tiny phosphate rock island nation located in the South Pacific Ocean south of the Marshall Islands in Oceania. It is only 53 kilometres (33 mi) south of the Equator at coordinates 0°32′S 166°55′E﻿ / ﻿0.533°S 166.917°E﻿ / -0.533; 166.917. Nauru is one of the three great phosphate rock islands in the Pacific Ocean—the others are Banaba (Ocean Island) in Kiribati and Makatea in French Polynesia. Its land area is 21 km2 (8.1 sq mi), and it has a 30-kilometre coastline (19 mi). Maritime claims are a 200-nautical-mile (370 km) exclusive fishing zone, and a 12-nautical-mile (22 km) territorial sea. The climate is tropical with a monsoon rainy season from November to February. A sandy beach rises to the fertile ring around raised coral reefs. The raised phosphate plateau ('Topside') takes up the central portion of the island. The highest point is 213 ft (65 m) above sea level, along the plateau rim. Nauru's only economically significant natural resources are phosphates, formed from guano deposits by seabirds over many thousands of years, and fisheries, particularly for tuna. Due to being surrounded by corals and sandy beaches, the island houses no natural harbours, nor any rivers or substantial lakes. Nauru has its own unique navigational system, which is only capable of being used on the island. Nauru is a raised coral atoll positioned in the Nauru Basin of the Pacific Ocean, on a part of the Pacific Plate that formed at a mid oceanic ridge at 132 Ma. From mid Eocene (35mya) to Oligocene times, a submarine volcano built up over a hotspot, and formed a seamount composed of basalt. The seamount is over 4300 metres high. This hotspot was simultaneous with a major Pacific Plate reorganisation. The volcano was eroded to sea level and a coral atoll grew on top to a thickness of about 500 metres. Coral near the surface has been dated from 5 Mya to 0.3 Mya. The original limestone has been dolomitised by magnesium from sea water. The coral was raised above sea level about 30 metres, and is now a dolomite limestone outcrop which was eroded in classic karst style into pinnacles up to 20 metres high. To at least a depth of 55 metres below sea level, the limestone has been dissolved forming cavities, sinkholes and caves. Holes on the topside of the island were filled up by a phosphate layer up to several metres thick. Anibare Bay was formed by the underwater collapse of the east side of the volcano. Buada Lagoon was formed by solution of the limestone when the sea level was lower, followed by collapse. Nauru is moving at 104 mm per year to the north west along with the Pacific Plate. Freshwater can be found in Buada lagoon, and also in some brackish ponds at the escarpment base in Ijuw and Anabar in the northeast. There is an underground lake in Moqua Cave in the southeast of the island. Extreme soil conditions are caused by high alkalinity, high phosphate levels and low potassium. Iron, manganese, copper, molybdenum and zinc are rendered unavailable to plants. Combined with thin or damaged soils this causes low fertility. Intensive phosphate mining during the past 90 years has left the central 80% of Nauru a wasteland and threatens limited remaining land resources. Nauru is party to the international environmental agreements on biodiversity, climate change, desertification, law of the sea and marine dumping. This is a list of the extreme points of Nauru, the points that are farther north, south, east or west or higher than any other location. ^ CIA factbook. "Nauru Terrain - Geography". www.indexmundi.com. Retrieved 19 April 2016. ^ Annual Report Part 1: Information on Fisheries, Research and Statistics: Republic of Nauru. Working Paper 17 of the 4th Scientific Committee of the Western and Central Pacific Fisheries Commission. WCPFC 2008. This page was last edited on 18 March 2019, at 10:22 (UTC).